About: My First Recession starts when the party is over. This study maps the transition of critical Internet culture from the mid-to-late 1990s Internet craze to the dotcom crash, the subsequent meltdown of global financial markets, and 9/11. 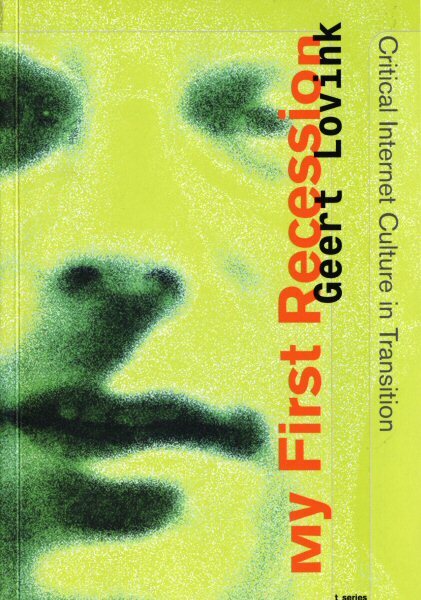 In his discussion of the dotcom boom-and-bust cycle, Geert Lovink lays out the challenges faced by critical Internet culture today. In a series of case studies, Lovink meticulously describes the ambivalent attitude that artists and activists take as they veer back and forth between euphoria and skepticism. As a part of this process, Lovink examines the internal dynamics of virtual communities through an analysis of the use of moderation and “collaborative filtering” on mailing lists and weblogs. He also confronts the practical and theoretical problems that appear as artists join the growing number of new-media education programs. Delving into the unexplored gold mines of list archives and weblogs, Lovink reveals a world that is largely unknown to both the general public and the Internet visionaries.